Entrega Gas Pipeline LLC v. Union Pacific Railroad Co., Missouri Pacific Railroad, City of Cheyenne, Granite Development LLC, Aspen Holdings, Inc., Berthel Land & Livestock, et.al. (Wyoming Federal District Court). (condemnation of easement for 328 mile pipeline, first leg of the 1,300 mile Rockies Express Pipeline extending from Wamsutter, WY to Clarington, OH). Westtex 66 Pipeline Company (ConocoPhillips) v. Bridle Bit Ranch Company, Jerry and Barbara Dilts Family Limited Partnership (Wyoming Federal District Court – diversity case). (condemnation of easement for natural gas liquids pipeline). Transportation Commission of Wyoming v. 29 Acres of Land in Natrona County, and Robert and Judith Bradshaw (condemnation for new beltway around City of Casper, Wyoming). Lower Valley Energy v. C.K. Farms, Anam Inc., Willow Springs Cattle Co., Analind Wyo. LLC. (condemnation of easement for natural gas pipeline through Hoback Canyon to Jackson, WY). Transportation Commission of Wyoming v. Flying Seven One, LLC, Flying Seven Two, LLC and Flying Seven Three, LLC (condemnation for new beltway around City of Casper). Questar Overthrust Pipeline Company v. Rock Springs Grazing Association, Red, Inc., Anadarko Land Co. (Wyoming Federal District Court). (condemnation of easement for interstate natural gas pipeline). Wyoming Interstate Company v. Nutting (Moffat County, CO). 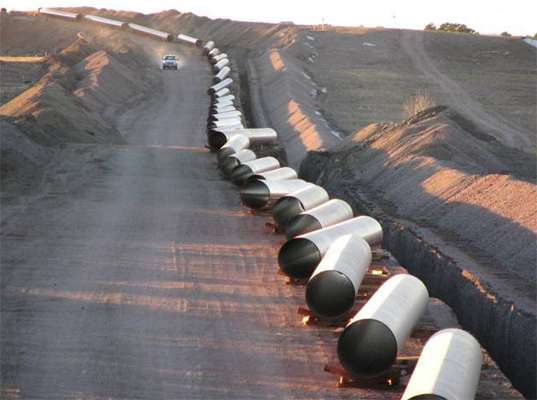 (condemnation of easement and immediate entry for purposes of interstate natural gas pipeline). Weaver Ranch, Inc. v. Rockies Express Pipeline LLC (Wyoming Federal District Court). (removal to Federal Court and defense of trespass and breach of contract claims relating to construction of Rockies Express Pipeline). Berthel Land & Livestock v. Rockies Express Pipeline LLC (Laramie County, WY). (defense of breach of contract and trespass claims arising from construction of Rockies Express Pipeline). Entrega Gas Pipeline Company v. Booth Land and Livestock, el al. (Albany County, WY). (access case, granting access to company for preliminary biological and civil surveys). Entrega Gas Pipeline Company v. Willadsen (Laramie County, WY). (access case, granting access to company for preliminary biological and civil surveys). TransColorado Gas Transmission Company v. Engleman,et.al. (condemnation of 60 properties in Colorado Federal District Court for 24 inch interstate natural gas pipeline from Farmington, New Mexico to Rangley, Colorado, for immediate possession order and restraining orders to accommodate construction schedule and prevent interference during construction). Enron Broadband Services, Inc. v. Broadwing Communications. (Albany County, WY). (three day injunction hearing seeking injunctive relief and temporary restraining order to prevent encroachment and additional cuts to fiber optic cable). Sutherland v. Union Pacific Railroad (Laramie County, WY). (temporary testraining order and preliminary injunction by landowner to prevent closure of railroad crossing. Alternative condemnation claim to establish railroad crossing). Kinder Morgan Operating L.P. v. Burlington Northern Santa Fe RR Co., (Campbell County, WY). (condemnation and declaratory judgment action for pipeline crossing after license denied by BNSF). Kinder Morgan Interstate Gas Transmission, LLC v. Werner (Converse County, WY). (complaint for injunction, easement by estoppel, and condemnation after landowner constructed pole barn within easement. Defense of counterclaim for trespass). Kinder Morgan Inc. v. BNSF Railway Company (Converse County, WY). (condemnation of railway company after railroad increased annual license fee for pipeline crossing). Nine Mile Land Company v. MEG Wyoming Gas Service, LLC (Campbell County, WY). (defense of trespass and injunction claims against gas gathering company). CMS Gas Gathering, LLC v. James Hardesty, et. al. (Sheridan County, WY). (condemnation of 23 properties in Sheridan County, Wyoming for construction and operation of coalbed methane gas pipeline, pumping stations and related facilities). KN Wattenberg Gas Transmission, LLC v. Kramer, et. al. (Weld County, CO). (obtain immediate possession of easements and resolve valuation issues for natural gas pipeline from north of Denver to Rockport Hub). CMS Gas Gathering, LLC v. Richard Bumbaca (Sheridan County, WY). (emporary restraining order and preliminary injunction after landowner prevented methane gas company from constructing pipeline across ranch property for transportation of coal bed methane gas). American Soda Company v. The Oil Shale Corporation (TOSCO) (Rio Blanco County, CO). (condemnation for private manufacturing concern of easements for underground soda ash slurry and return water pipelines for transportation of soda bicarbonate to processing plant). KN Interstate Gas Transmission Co. v. Hendrix, et. al. (Converse County, WY). (condemnation of several parcels of real property in limited time frame to secure easement for construction and operation of natural gas pipeline). Amoco Pipeline Company v. Burlington Northern Sante Fe. (Platte County, WY). (condemnation of several pipeline crossings at intersections with railroad in order to accommodate construction and maintenance of oil and gas pipelines). Western Gas Resources v. Vollman (Campbell County, WY). Complaint for temporary restraining order, injunctive relief, and ejectment, after landowner interfered with pipeline construction and remediation. Coastal Chem, Inc. v. Timnath Land & Cattle Company (Laramie County, WY). (condemnation and immediate possession for water supply pipeline for manufacturing purposes. Texaco Exploration and Production v. Horton (Federal District Court, Wyoming). (complaint for temporary restraining order and permanent injunction after entry for drilling purposes refused. Amoco Pipeline Company v. Kayo Smith, et. al., (Goshen County, WY). (ondemnation and immediate possession proceedings relating to pipeline across land and Oregon Trail crossings with related historic and environmental concerns). KN Interstate Gas v. Lazy D Grazing Association (Weld County, CO). (condemnation of land owned by grazing association, order for immediate possession). Western Gas Resources v. William Garrett et. al. (Campbell, County, WY). (condemnation for construction and maintenance of coal bed methane pipeline. Access and valuation issues). KN Wattenberg Gas Transmission LLC v. Notary, et. al. (Weld County, CO). (immediate possession of easements and valuation issues for natural gas pipeline from North Denver to Rockport hub in Weld County). CMS Gas Gathering, LLC v. Barlow Livestock Company, LLC (Campbell County, WY). (condemnation of several properties for purposes of constructing and operating coalbed methane gas pipelines, pumping stations and related facilities). Fort Union Gas Gathering, LLC v. Greer, et. al. (Campbell County, WY). (condemnation of fifteen properties for purposes of constructing coalbed methane gas pipeline). MCI WorldCom Network Services v. Conoco, (Sweetwater County, WY). (condemnation of easement for fiber optic cable). Redstone Resources, Inc. v. Donald Joslyn (Campbell County, WY). (TRO and later Preliminary Injunction to prevent eviction of CBM producer from property by owner). Kinder Morgan, Inc. v. Cross (Converse County, WY). (preliminary injunction for access to property for routine maintenance, and permanent order for continued access). Kinder Morgan, Inc. v. Trail Ridge Land Company (Campbell County, WY). (enforcement of existing easement for access to pipeline, and condemnation of new easement for extension of pipeline).